The hottest nightlife event is taking over #Perth city once again! Our last event went off with a full house of the hottest vibes. We’re excited to partner up with Party Nation to bring you an even BIGGER event! Get ready to soak some Jamaican vibes and experience a tropical escape to make your Easter weekend one to remember!! 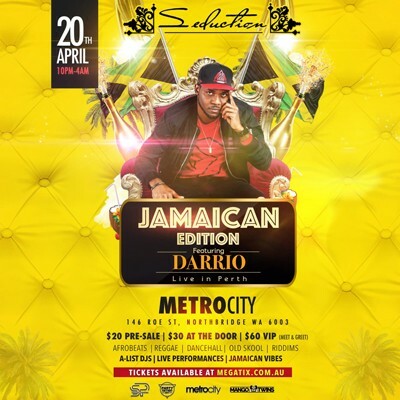 🌴🍹😎 Jamaican artist DARRIO will be gracing the event and making his first debut Australia!!!! The #Reggae #Dancehall star has worked with notable artists including Vybz Kartel and Konshens. ▄▄▄▄▄▄▄▄▄▄▄▄▄▄▄▄▄▄▄▄▄▄▄ ▄ ▄ ▄ ▄. PERTH! Get ready to wine up in it! SAT 20th APRIL Metro City will explode with wicked riddims and vibes. It will be a total shutdown! Don’t miss one of the greatest dancehall events of the year.